February, 2002 - Every January I travel back to Wisconsin to visit my family. One of the highlights for me has become an annual tradition, teaching quilting classes to any family members who want to learn. This year the focus was on foundation paper piecing. My niece Gretchen started what I thought was a very ambitious project for someone who had never paper pieced before. 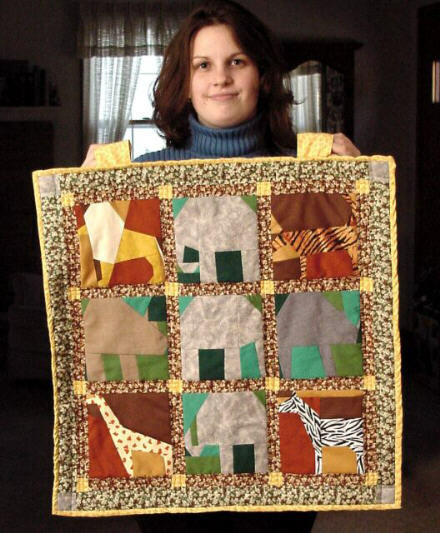 But she persevered and had this wonderful jungle quilt finished before I left! Super job, Gretch! The blocks all came from Sew Precise Collection 3, quilt design software from the Electric Quilt Company: Lion, Tiger, Hippo, Rhino, Giraffe, Zebra, and Gretchen's favorites, the 3 Elephants.